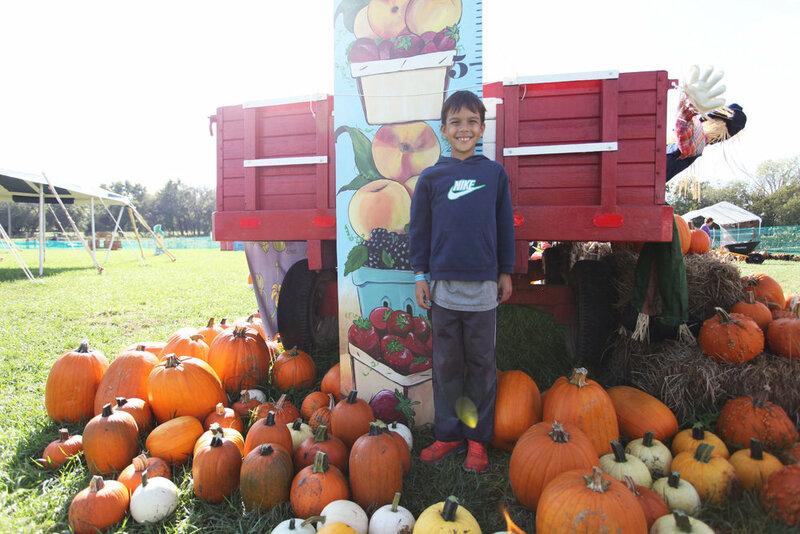 Pumpkin patch pictures are a lot like first day of school photos, or Halloween photos. You just have to share them. And you don't care if people enjoy them or not, because to you - they're your kids with pumpkins and nothing is cuter. So, here you go. No pumpkin patch is complete without a corn maze. My family thought it was a sprint and basically ran the entire hour we where in there. Yah, that was fun. #not Don't the kids know mama doesn't run in boots? I tried to take video but was out of breath the whole time. Mama is not in shape. Wondering what the farm did with all that corn? Oh don't worry, they just made it into a GIANT CORN POOL. Like literally, giant. Kids couldn't even touch the bottom. Taking the hayride (minus the hay) out to the corn maze. Teenager looks thrilled. He's always thrilled with anything I say or do these days. One of the baby because SHE'S THE BABY, and she still does everything I say and does it so super cute too. When they're in a family band one day, this will be their album cover. And finally, could this photo be any more Kansas? My girl with her KC hat on, KU sweatshirt on - standing in a field of the state flower. LOVE. For you local KC people, this pumpkin patch was Gieringer's Orchard - super fun!